At the start of Friday's quarterfinal matches an all-American-stacked top half of the draw guaranteed that an American will reach the final on Sunday. In the six years of the BB&T Atlanta Open, Americans have swept all six titles. The four Americans battle for a chance to continue the streak is between 18-year-old wild card Reilly Opelka, Atlanta resident Donald Young, 18-year-old Taylor Fritz, and three-time champion John Isner. Fritz is the youngest Atlanta quarter-finalist in tournament history at 18 years, 9 months. This is the first time two 18-year-old Americans have reached the quarter-finals of an ATP World Tour tournament since Los Angeles in 1990 when Michael Chang reached the final and Pete Sampras advanced to the semi-finals. History was again made on Friday as Opelka continued his run and pulled another upset. It's not often a player ranked over 800 in the world makes a run at an ATP World Tour event. This time the victim was hometown favorite and seventh-seeded Donald Young.The hard-hitting Opelka played with a strong presence at the net and a purpose in winning 6-4, 6-4. Opelka started quickly with a break in the first game. A clearly irritated Young failed to counter Opelka’s break as he struggled with Opelka's serve. Opelka continued the hot play and big serving converting a breakpoint in the fifth game and delivered six aces in the second set to walk off the court with yet another big win. Earlier in the week, Opelka earned his first ATP victory against Georgia Tech player Chris Eubanks in the first round and continued the streak with an upset over third-seeded Kevin Anderson in the second. Opelka's next opponent, three-time defending champ, John Isner. 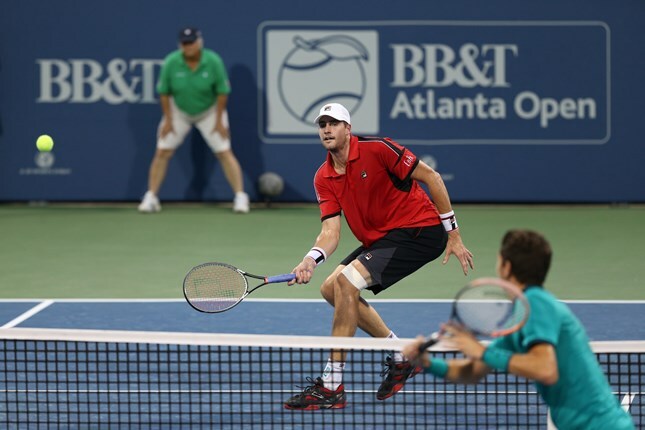 Isner stepped onto the stadium court Friday night riding an impressive streak here in Atlanta. He had won 13 consecutive matches and is 21-3 overall at the BB&T. This match against Fritz would not be easy. In the first set, Isner had a couple of early break chances but wasn’t able to convert until the ninth game to take a 5-4 lead. Fritz fought hard, but he couldn't gain any traction on the Isner serve. Isner totalled 12 aces in the opener. In the second set, Fritz appeared to have issues with his right shoulder, getting visited by the trainer on two changeovers. Isner didn't let up and continued to use his strong serve. He went up 4-3 on a break and then finished with an ace on match point to finish off Fritz 7-5, 6-4. Isner advances to his seventh consecutive semifinal in Atlanta. During the day session, Spanish star Fernando Verdasco fell to second-seeded Australian Nick Kyrgios 6-4, 7-6(5), 6-3. Verdasco struggled to keep up with the young Aussie’s serve as Kyrgios totaled 18 aces. Kyrgios took the first set by securing a break in the third game with an ace. In the second set, both traded holds leading up to a tiebreaker where Kyrgios fell victim to Verdasco’s strong and strategic groundstrokes. Kyrgios bounced back in the third set, winning 80% of service points to take the match. “I came out (feeling) real good. I wanted to get up on him early,” admitted Kyrgios.